SCP-1609 prior to its acquisition by Global Occult Coalition agents. Special Containment Procedures: SCP-1609 is contained at Storage Site-08 due to the difficulty of transporting it from that location. SCP-1609 is to be contained in a specially-designed enclosure at that site, within a flower bed in which a range of aesthetically-pleasing flowers and plants are to be cultivated. It is to be used as mulch within this flowerbed. The flower bed is to be tended regularly, and all visitors to the enclosure must remark on the beauty of the flowerbed, with particular emphasis on the quality of the mulch. SCP-1609 is to be removed from the flowerbed at regular intervals so that it can be treated with wood, metal and fabric preservatives. Personnel are to announce their intentions in the presence of SCP-1609 before attempting to remove it for this purpose. Personnel assigned to SCP-1609 are required to wear plain clothes in order to prevent accidentally triggering a violent response from SCP-1609. No items with motors are allowed within a 200-metre radius of SCP-1609’s containment area. No personnel either presently or previously affiliated with the Global Occult Coalition, nor material referencing them, are to be allowed within Storage Site-08. In the event of a violent reaction from SCP-1609, all personnel are to exit the immediate vicinity and a message is to be played over the site’s interior speakers informing site staff of the event. Should SCP-1609 be sighted outside of its containment area following a violent reaction, staff are to act in a submissive, non-threatening manner. Formal clothing, such as jackets, lab coats, protective clothing, jumpsuits, and particularly body armour are to be removed if possible in the case of such an event, and any weapons capable of damaging SCP-1609 are to be immediately discarded. Staff are to ask SCP-1609 to return to containment without attempting to threaten or command it. Should SCP-1609 exit Storage Site-08, Agents are to be immediately dispatched in order to scan the surrounding area for SCP-1609 and if possible retrieve it. At present, there exists no way to totally prevent SCP-1609 from breaching containment; current containment procedures centre on encouraging SCP-1609 to remain within its containment area. Description: SCP-1609 is, at the present time, a pile of splinters, wood chippings, furniture nails, and scraps of bleached leather and fabric, weighing in total approximately ██.█ kilograms. The wooden portions of SCP-1609 are made of oak, and the nails are made of steel. SCP-1609 is capable of teleportation, being capable of moving its entire mass instantaneously between two points without any known limit. SCP-1609 usually uses this to bring its constituent parts together when parts of SCP-1609 have been removed from the mass, but SCP-1609 can teleport its entire mass at once, on at least one occasion at a distance of ████ kilometres. SCP-1609 is capable of splitting its mass, though it does this rarely. Any amount of material removed from SCP-1609’s mass continues to display SCP-1609’s properties. SCP-1609 has resisted all attempts to remove it from the confines of Storage Site-08, teleporting back to the site of its own accord. However, it has previously teleported out of Storage Site-08 for brief periods before returning, although this has only happened on █ occasions since its arrival in Foundation custody. SCP-1609 appears to be in some way sentient, as research indicates it is able to perceive its environment in a manner that is currently poorly understood, and is able to react to stimuli in an intelligent fashion. Details of SCP-1609’s behaviour are poorly understood, although it has been ascertained that it will react in self-preservation, and will react aggressively to certain stimuli which it connects with a threat to its existence. Aside from this, SCP-1609 appears to prefer situations in which it is utilised by humans, and will actively seek out situations where it can be put to use if it is left idle. This is the reason for the Foundation’s present use of SCP-1609 as mulch, as this prevents SCP-1609 from becoming idle and attempting to leave Storage Site-08. It is theorised that SCP-1609 is capable of understanding human speech or thought, although this cannot be determined as it does not comply with tests designed to gauge its awareness of such stimuli. When exposed to a number of specific stimuli, SCP-1609 will react violently. During a typical violent reaction from SCP-1609, it will teleport a portion of its mass inside the lungs of nearby personnel, causing immediate and severe lacerations to the interior of the lungs, as well as pulmonary obstruction, which rapidly leads to the victim’s death. Stimuli which can instigate a violent reaction from SCP-1609 include: personnel wearing the uniform of, or clothes similar to the uniform of, personnel affiliated with the Global Occult Coalition; utterance of words or phrases used heavily or exclusively by GOC operatives, such as ‘threat entity’, while in contact with SCP-1609; any action demonstrating hostility towards SCP-1609; and the sound of a running motor. Violent responses from SCP-1609 are rare — only █ such events have occurred since containment, and SCP-1609 quickly reverts to a passive state after such a response if it does not continue to feel threatened. SCP-1609 arrived in Foundation custody on ██/██/████, after teleporting into an unused containment cell at Storage Site-08 in its current state. 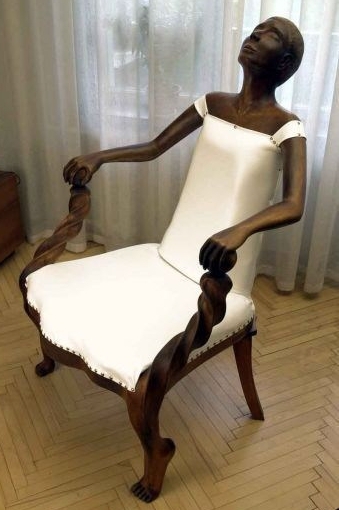 Careful investigation has revealed that SCP-1609 was originally a large chair made of varnished oak and bleached leather, carved in the form of a reclining woman in a restful state. SCP-1609 appears to have possessed its anomalous properties in this state, albeit with certain limitations, namely that the object would only teleport when a person within a certain radius (currently unknown) felt the need to sit down or rest without a comfortable seat or chair nearby. At this point, SCP-1609 would teleport to them and remain in place until another person experienced a similar urge. On ██/██/████, both Foundation operatives and members of the Global Occult Coalition were made aware of the existence of SCP-1609, which was given the temporary designation of E-622. Due to the hard-to-contain nature of SCP-1609 and the possibility of its existence causing a breach of secrecy regarding the existence of supernatural phenomena, a small-scale effort to contain SCP-1609 was launched by GOC forces. It is presently unknown how exactly GOC operatives captured SCP-1609, but it is known that they succeeded in reducing the object into its current form using a woodchipper. Further attempts to destroy SCP-1609 failed, due to its properties and ability to teleport away from sources of danger. Following this event, several members of the Global Occult Coalition died under unusual circumstances. Investigation through both official channels and embedded Foundation agents within the GOC has potentially linked SCP-1609 to at least three deaths of personnel within the Coalition, although the true number of casualties amassed due to their mishandling of the item is unknown. SCP-1609 then arrived in Foundation custody. It is unknown how SCP-1609 was aware of the existence of the Foundation, although it is theorised that it entered Foundation custody due to a low risk of further damage to itself. SCP-1609 represents a perfect example of the flaws inherent in the operating procedure of the GOC, and serves as a cautionary tale for any members of the Foundation who disagree with our practices on containing dangerous objects. Prior to the Coalition getting their hands on this, it was perfectly harmless. A chair which teleports to you when you need a seat is normal compared to most of the stuff that we deal with on a regular basis. When they put it through a woodchipper, it got hurt, scared and angry, so it lashed out at them. By trying to 'protect the world' by destroying it, they inadvertently made the situation a whole lot worse. SCP-1609 went from being harmless to deadly in the space of a few minutes because of the GOC, and we had to clean up the mess. Thankfully, SCP-1609 is pretty simple for us to deal with. So long as we don't do anything stupid around it, it won't fight back and it won't try to leave. Even if it does, it usually comes back. I think I've worked out why. It came to us because it was afraid of the people who had hurt it. That's why it always comes back. It's afraid of the rest of the world now, and it's looking to us for protection. This is why we have Special Containment Procedures instead of Special Destruction Procedures. If you break something, it's broken forever. When you try to destroy an anomaly, you can't take back your mistakes. That's what SCP-1609 has to tell us. This is why we're right and the GOC is wrong, people.